To help identify and select potential promising practices in TVET we developed a framework containing a set of criteria and indicators. This framework was extensively discussed with and validated by a panel of external experts, in collaboration with UNESCO and UNESCO-UNEVOC staff. It concentrates on key elements in identifying and analyzing promising practices in TVET areas. The first prerequisite for a promising practice is that it is relevant to TVET. In other words, it promotes TVET in some profound way, either within a particular TVET sub-sector or at local, national or regional level. Moreover, we introduce six criteria that represent important indicators of a promising practice in TVET. 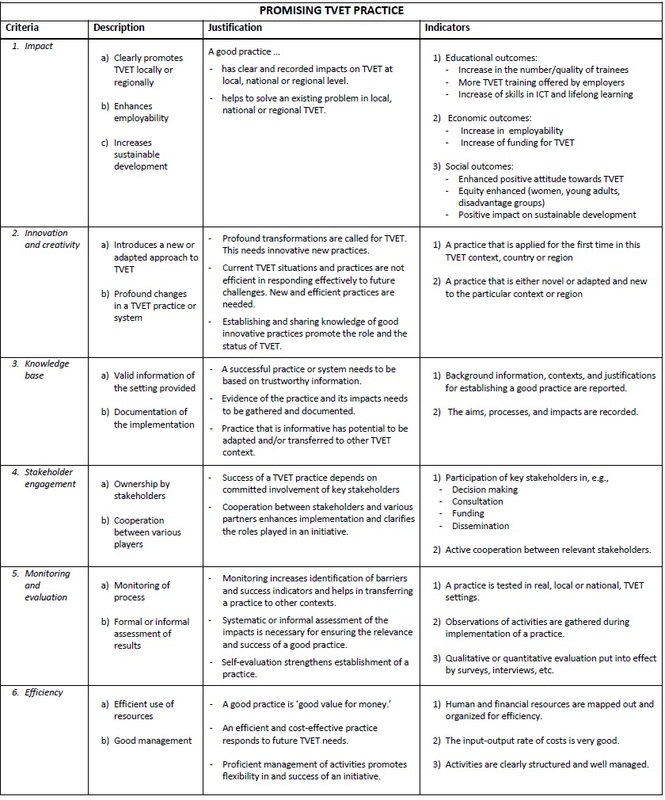 The conceptual framework is presented in the following table. Six main criteria were selected, based on a review of the literature, analysis of papers reporting good or promising TVET practices, and validations by TVET experts. The six criteria are impact, innovation and creativity, knowledge base, stakeholder engagement, monitoring and evaluation, efficiency. Descriptions and justifications illustrate the features and significance of each criterion in assessing TVET practices. The last column, titled 'indicators', presents examples of how each criterion can be identified or measured. Potential promising practices are identified and pre-selected by UNESCO-UNEVOC staff before being summarized and sent to external reviewers for evaluation, based on the assessment framework and an established mechanism for applying it. Those practices that reach a minimum threshold are selected for inclusion in the database. To insure the relevance of the practices that are published in the database, the UNESCO-UNEVOC International Centre requests the opinion of TVET experts from all over the world. Promising Practices Reviewers provide their inputs on a voluntary basis and UNESCO-UNEVOC would like to thank them for the time they dedicated to increase the quality of the service. UNESCO-UNEVOC would also like to thank Ms. Claudia Pompa and Mr. Salim Akoojee for their support in identifying promising practices.